I got a spinning wheel recently (yay!) and have been playing with string a lot. 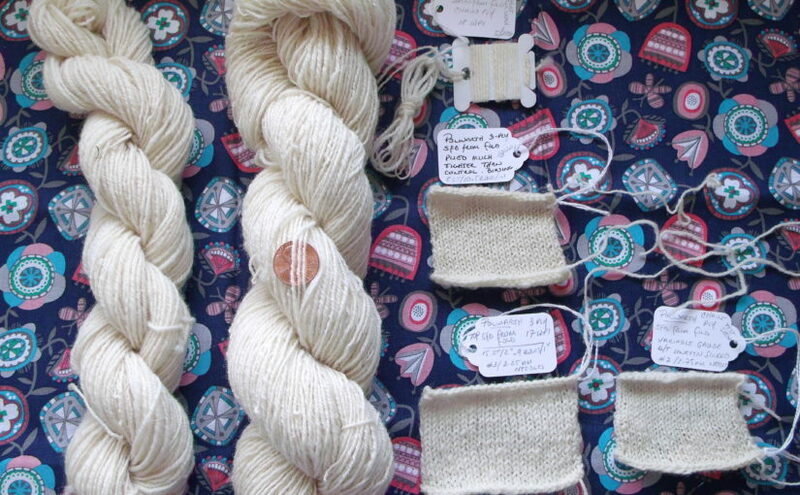 I had a pound of undyed Polwarth top set aside for when the wheel came since I knew there’d be a bit of a learning curve even though I’ve been spinning on spindles for five years. 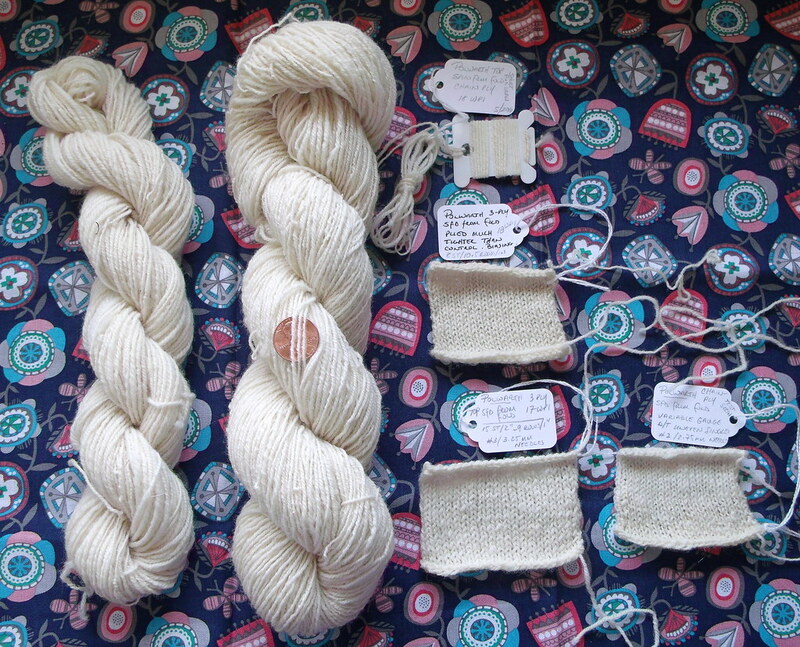 I spun up about an ounce of singles and then chain-plied them, just to get an idea what sort of yarn I was coming up with. Well, actually, no. First I spun about a half ounce of singles that started out wildly uneven and got gradually thinner and thinner, completely lost the end when the yarn broke because I was watching Good Will Hunting and got all weepy and lost track of what I was doing, and then I gave up trying to find the end after an hour and a half on the grounds that this was just practice and it was horribly uneven anyway. 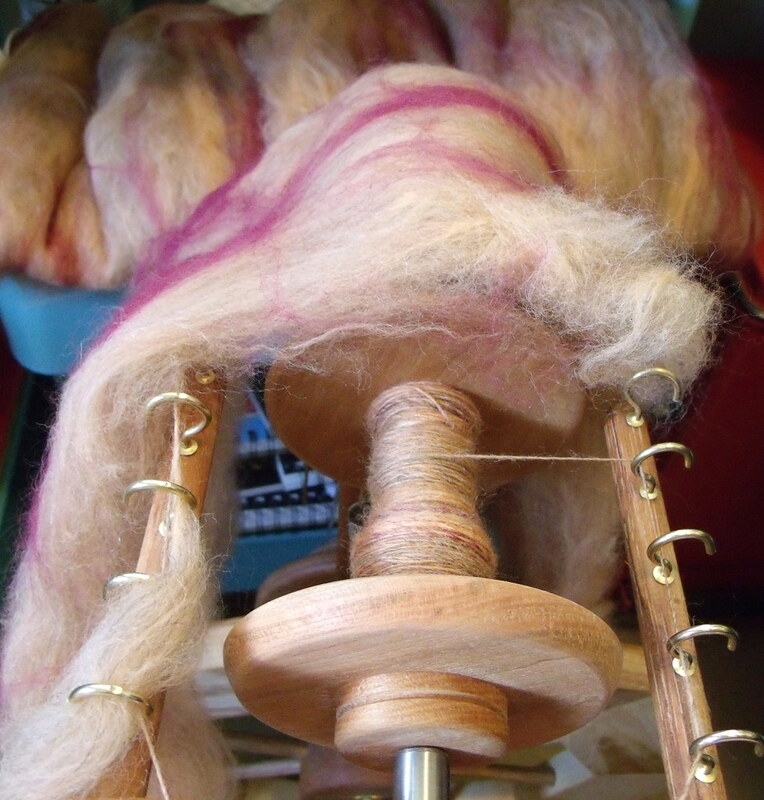 Then I spun an ounce of singles and plied it. Anyway. Based on that test skein, I decided that what I was doing was working out okay for me (short forward draw, spun from the fold to make the yarn a little puffier) so I made a little control card with samples of the singles and of the yarn before and after finishing. Three ounces of singles later, I started plying. I did not actually look at the control card while I was plying, even though that’s what the control card is for. It was upstairs and I was downstairs watching Netflix, and I developed a delusional belief that the yarn would magically come out the same without looking at it. It did not. It was plied way, way tighter than the test skein, which became obvious when I was finishing the skein. I let it dry and knitted up a swatch and washed it to see what would happen. The swatch knitted from the super-tight yarn biased like crazy — it’s the parallelogram-shaped one in the middle. So I wound the whole skein into a big ball and ran it through the wheel again to take some of the plying twist out. That turned out pretty well. There are still some odd kinked bits that didn’t work themselves out when I re-soaked it, but overall it’s looking much better now (bottom swatch). It’s also working up way differently now — I used a bigger needle but got roughly the same fabric density as the first swatch with the extra plying twist. And the stitches look different, too. One side of each stitch is twisted tighter in the parallelogram swatch, making it look like a separate column, rather than both sides being more or less similar little V shapes in the second swatch. The third swatch (on the right, made from the chain-plied skein) is mostly an exercise in why chain-plying isn’t always your friend. Or mine, at any rate. The singles in that skein were uneven, much more so than in the second one, and chain-plying tends to magnify any unevenness. With chain plying, you’re taking a single strand and making a big crochet chain with your hands while adding the plying twist. It looks like a 3-ply for the most part, and it’s super useful for stuff like keeping long runs of color in dyed fiber intact. But the thin spots line up with themselves, and so do the thick spots, whereas in a 3-ply it’s more random. So the chain-ply swatch is pretty much crazytown. The bottom half is twisted tighter (causing the same effect as in the parallelogram swatch) and the stitches are bigger and feel sort of crispy, and in the top half there’s less twist, and the stitches are all happy and soft. This isn’t entirely the fault of chain-plying uneven singles — I’m pretty sure my plying twist was uneven as well. I’m going on with spinning this stuff (I have something like 10-12 ounces left) and then dye the whole pile of yarn at the end. In the meantime, though, I sort of cracked and started spinning something with a bit of color to it.